Plastic Overmolding is the injection molding process where one material (usually a TPE) is molded onto a second material (typically a rigid plastic) by using heat and pressure along with liquid silicone. If properly selected, the TPE overmolding design will form a strong bond with the plastic that is maintained in the end-use environment. The use of primers or adhesives is no longer required to achieve an optimum bond between the two materials. Why Use Plastic Substrate Molding? Provides a soft grip surface around a part of the separate material. Break up color (aesthetic impacts). Adds flexible areas to a rigid part. Eliminates assembly line time. Instead of manufacturing a metal tool and a plastic hand grip separately and then joining the two together manually or with automation, you can just overmold the metal tool with a plastic hand grip and eliminate the need for assembly altogether. Captures one part inside of another without having to use fasteners or adhesives. Insert plastic overmolding is the most common and widely used process that is used. Insert molding occurs when a pre-molded insert is placed into a mold and the TPE is shot directly over it. The biggest advantage of this type of substrate molding design is that conventional single shot IM machines can be used, and the tooling costs associated with insert molding are lower than with multi-shot processing. This type of heat and pressure substrate molding requires a unique injection molding machine that is equipped with two or more barrels, allowing two (or more) materials to be shot into the same mold during the same molding cycle. This type of plastic overmolding is often chosen to reduce cycle times, achieve superior part quality, and to reduce labor costs. Different types of materials that are used during the plastic overmolding process will either be harder, softer or a combination of both. Certain product overmolding designs will require a “grippy” or “squishy” quality regarding the handle. What then is the process that determines the materials that are required to achieve those qualities? The processes stated below are often used to determine what types of materials are required for a given effect. When choosing a soft touch TPE, designers usually ask for the softest material available. What they do not know is that the soft durometer of a TPE adds little value to the concept of "cushion" when thickness of the TPE is below a certain point (typically > 0.040"). This means that the thinner the TPE over-mold, the harder it will feel. One way of getting around this issue is to incorporate multiple ribs that are placed closely together to create the perception of thickness without using a large amount of material. One common myth in the TPE industry is that the durometer (or hardness) of a material is directly related to its flexibility. This is not always true; for example, a 65 Shore A SEBS material is much more flexible than a 65 Shore A TPU. Instead of using Shore Hardness, a more suitable measure of flexibility is the flexural modulus, which measures a material's resistance to bending. A higher flexural modulus typically means that a material will feel more stiff and unyielding. When two surfaces are dragged flat against each other, the resulting resistance is characterized as friction. The coefficient of friction (COF) characterizes the degree of force required to move one surface across another - either from a complete stop (static friction) or when the surface is already moving (kinetic friction). Typically, TPE's are described as rubbery or "grippy". One area that product designers often misunderstand is the relationship between durometer and COF. Most believe that the softer the TPE, the greater the COF - this is a very general statement and is not true in all cases. 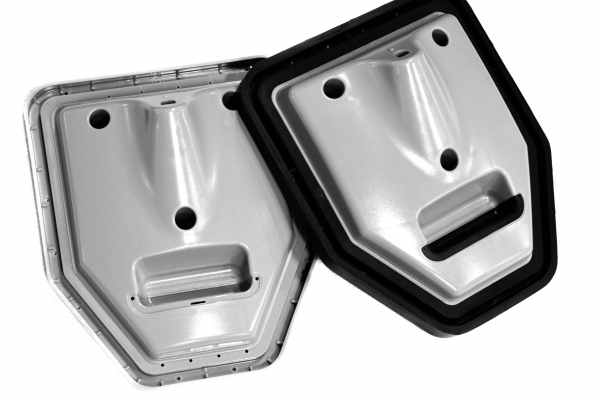 Contact us for more information regarding our plastic overmolding design capabilities, or request a quote today.